Its been a long time (after my last post). You might be wondering what took me this while to come up with a blog post. There were couple of occasions I enhanced NUMSys, however creating a Web version of it was never in my mind. It all started with a discussion on Network54. For NUMSys to be a Security Viewer, there is a long way to go (or maybe a short one), however this is a start. You can drag and drop users/groups to parent groups while importing groups. 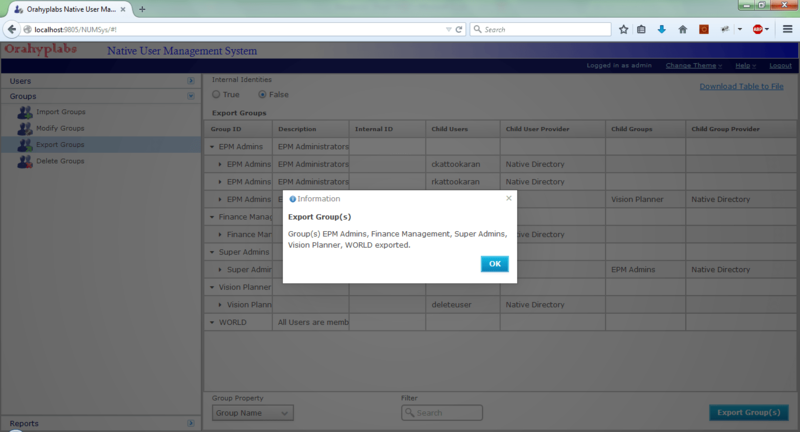 You can create reports from Shared Services. Watch out for that section – I’m planning to add Security reports (Essbase/Planning/Workspace) into Reports Section of NUMSys. All the features of NUMSys client version is ported to the Web release. You can use filters while exporting Users/Groups. You can also remove users/groups once the information is populated. I’ve two users who end with *karan, however I only want to export ckattookaran. I can then right click on gkattookaran and clear that row. NUMSys comes with an installer, which can automatically configure it to an existing Weblogic domain. A windows service will be installed after the end of the configuration. For *nix users a start and stop scripts will be created in the bin folder. Please follow the documentation on how to install here. You can download NUMSys web version. This tool can exist on Linux platform? We are on exalytics platform and I don't think that I can use this tool is this status right?